So Tobie and I both love the movie The Fifth Element. Luc Besson's crazy, vibrant vision of a possible future that is both alien and familiar was a heck of a lot of fun and it's that energy and dynamism that we really liked. We will never get tired of saying "multi-pass!" whenever we can find excuses to do so. Valerian and the City of a Thousand Planets is his latest science fiction movie project that apparently was something that he has wanted to do since around the time of The Fifth Element but the technology just wasn't there yet. But with advances in special effects capabilities, the movie is certainly possible. As much as we love Luc Besson, we also know he can be a little hit or miss when it comes to his creations. His visual style is always something worth celebrating and he really knows how to paint movies in visual ways. But some of his writing quirks may not work too well on an international stage and thus making his stories harder to understand or even appreciate. Synopsis: Valerian and the City of a Thousand Planets is a science fiction action movie written and directed by Luc Besson. The movie uses characters from the French comic book series Valérian and Laureline, written by Pierre Christin and illustrated by Jean-Claude Mézières, who also worked on the concept art for other Besson movies including The Fifth Element. Valerian (Dane DeHaan) and Laureline (Cara Delevingne) are special agents for the human police forces and regularly get dispatched on missions together. Their latest mission involves retrieving a very rare item that had been stolen and bringing it back to Alpha, an ancient Earth space station that has been added to over and over across the years and is now a sprawling space city representing a horde of different alien species. But at the start of the mission, Valerian experiences a very vivid dream of a primitive (pre-space flight) alien species on their last day before their world is destroyed. It's not clear why he has had this dream but in time their new mission has him encountering members of this same species. And how all this ties together turns out to be a much larger conspiracy that may go to the very heart of their government. What I Liked: I really like the sort of alien designs we see in these Luc Besson movies and I respect that involves the visual designs of Jean-Claude Mézières more often than not. And man, the opening sequence that explains the origins of space station Alpha is a beautiful one that includes showcasing a lot of different alien character designs that was a lot of fun. And things get really exciting once we get to explore parts of Alpha and more of the different alien races that call the place home. 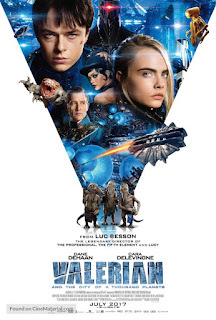 There's also some great action in this movie, the best example being Valerian's pursuit of the mystery attackers stating from him running through walls in Alpha to chasing after the unique alien vessel. Alpha in itself has so much character and making sure that the story's action sequences made full use of this environment really helped drive things along. What Could Have Been Better: The movie suffers from very weak performances by the leads and even side characters portrayed by the likes of Clive Owen and Rihanna. Given a world with such beautiful and diverse visuals and loud and bright color palettes, it's sad to have two downer characters who play cool, calm, collected as more drugged up and monotone. Why did things go in this direction? Why did he chose these actors? Then there's the story, which took a back seat to the overall visual design. There was a lot of terrible, awkward dialog and scenes that didn't quite make sense in terms of the overall story. We had the three little aliens that were somehow more funny than the rest of the movie, which as a whole was trying to be very serious. And we spent way too much time trying to unlock the files on the planet only to find out that there's yet another layer of security getting in the way of things. So many weird narrative decisions in play. TL;DR: Valerian and the City of a Thousand Planets is an ambitious science fiction adventure that could have benefited from some serious editing in terms of the story. I love Besson as a director and he can really make some fun movies about the far future but maybe the writing should be handle by someone else.